When I took the photos, I assumed it was a cocoon. I was curious to see what moth would emerge, so I took it home with me. After looking through Tracks & Sign of Insects and Other Invertebrates, I realized it was actually an egg sac for a Spinybacked spider (Gasteracantha cancriformis). In fact, I had seen many of those spiders in the area. 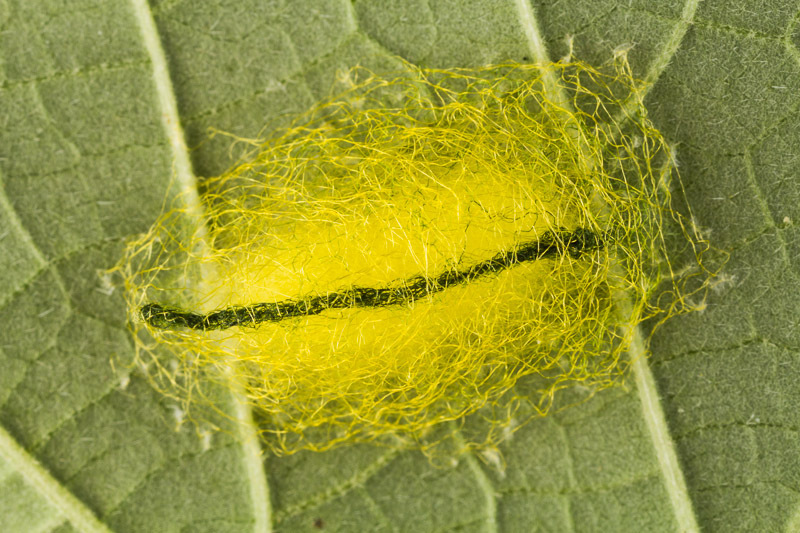 The egg sac’s yellow silk, dark longitudinal line, and placement on the underside of a leaf all point to this species. 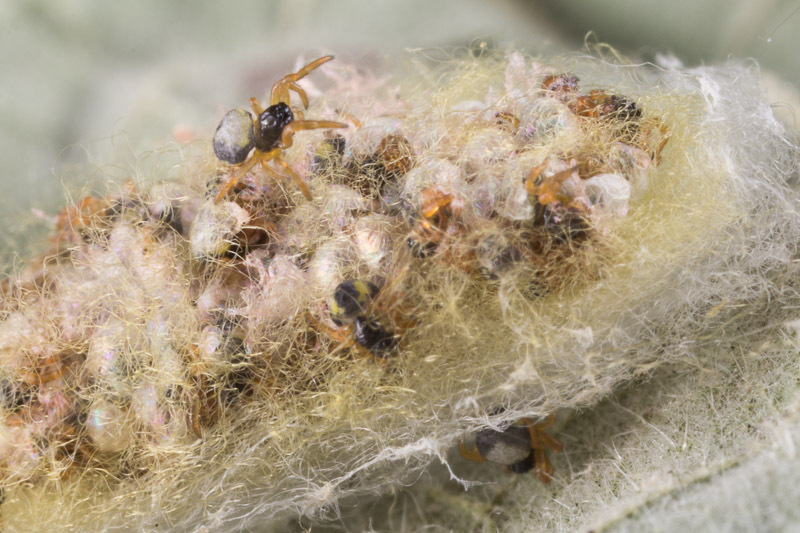 In Spiders of the Carolinas, L. L. Gaddy notes that in over twenty years of fieldwork he’s not seen the egg sac or male of this species. Perhaps I’m just lucky, but I suspect I’m more of a leaf flipper than Gaddy. 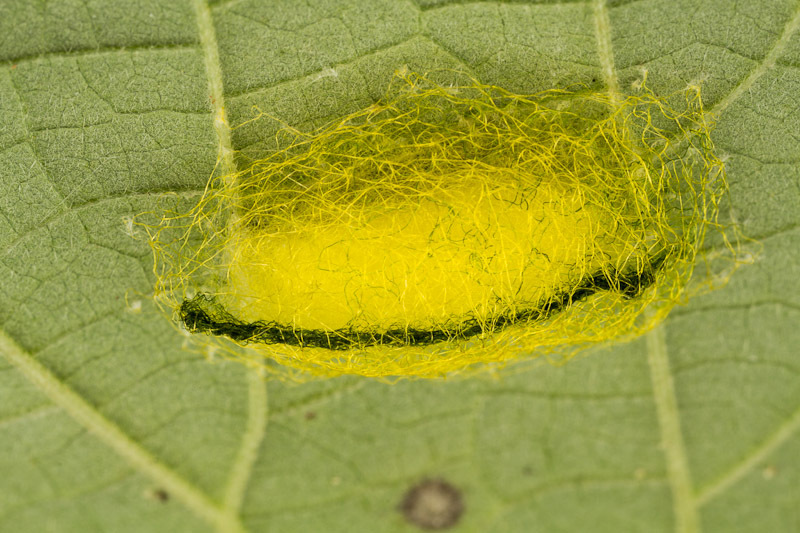 The egg sacs are placed on the undersides of leaves, which is where I’m always checking for caterpillars. I was curious to see the spider eggs, so I peeled back a few layers of the silk and found the spiderlings had already hatched. 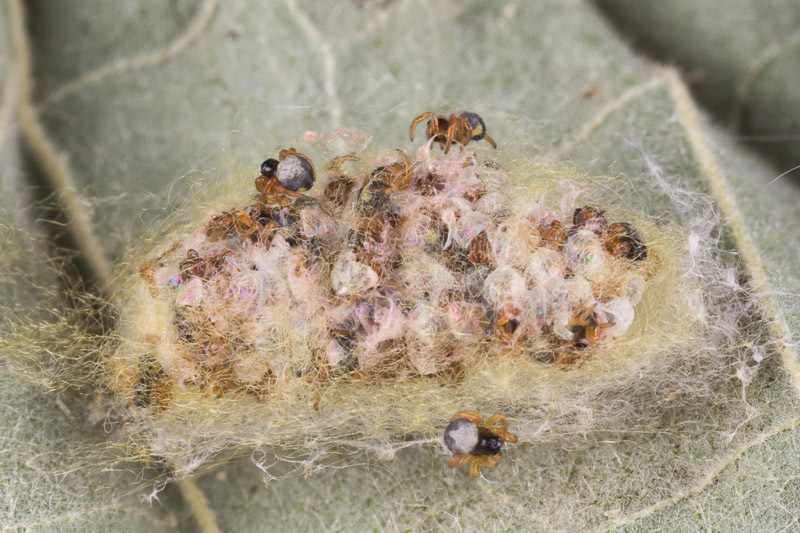 Turns out they stay in the egg sac for weeks before emerging. I had hoped to see the spiderlings grow, but they all died after a few weeks. This entry was posted in Sign Challenges. Bookmark the permalink. A few weeks ago I spotted an individual of this species in the park next door. I figured that was probably just an odd outlier, but strange nonetheless. Now I just found two more in my backyard. I’ve never seen them this far North before. Remember how I said all my spiderlings died? Well, I dumped what was left along with some other detritus in my backyard. I believe now that the spiderlings weren’t all dead after all, or perhaps there were some unhatched eggs. In any case, I appear to have inadvertently introduced them to the immediate area. Oops! I’m not too worried. One only needs to drive a few hours South to find these, so I suspect they won’t survive the winter. Awesome egg sac! Great find & shots.